Simulates eight different source strengths - using only one source! The Lineator is a simple device to accurately and reliably verify the linearity of your dose calibrator. Test results are available in minutes, without waiting days for decay, making it feasible to perform a linearity test more often. Early identification can prevent problems before they occur. 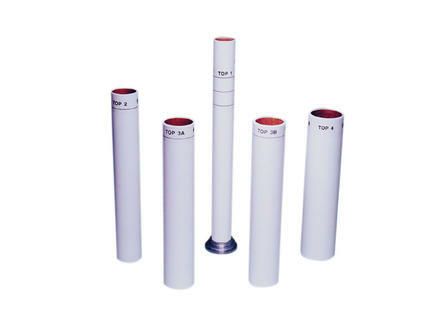 The Lineator is a set of five tubes. Four tubes are used to perform the test and an interchangeable tube is used depending on the dynamic range needed to cover. To perform a linearity test, insert a source of Tc-99m of the maximum activity to be measured into the central tube, then place the tube into the chamber of your dose calibrator and count. The remaining lead-lined tubes are placed, one at a time, concentrically over the central tube and counted individually or in combination. The readings are then normalized with predetermined factors, and the degree of linearity can be seen virtually at a glance. Using only one source, the Lineator can simulate up to eight different source strengths. Each outer tube absorbs a portion of the source radiation and reduces the effective source activity seen by the dose calibrator.